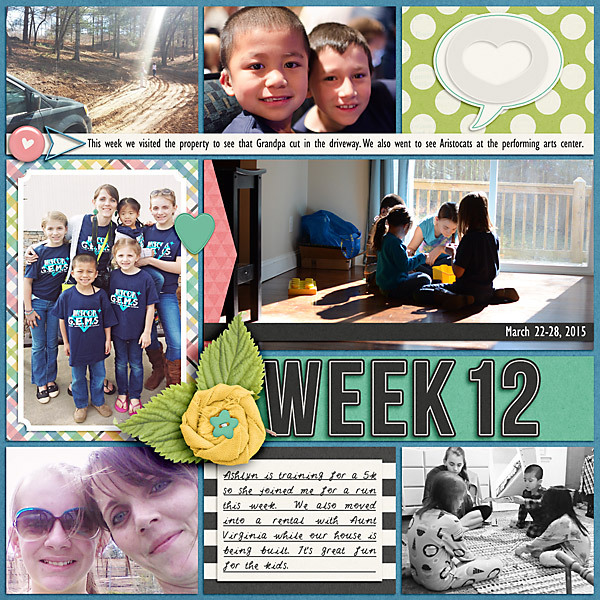 When you look at my page this week you definitely know what was going on. It consumed our week. 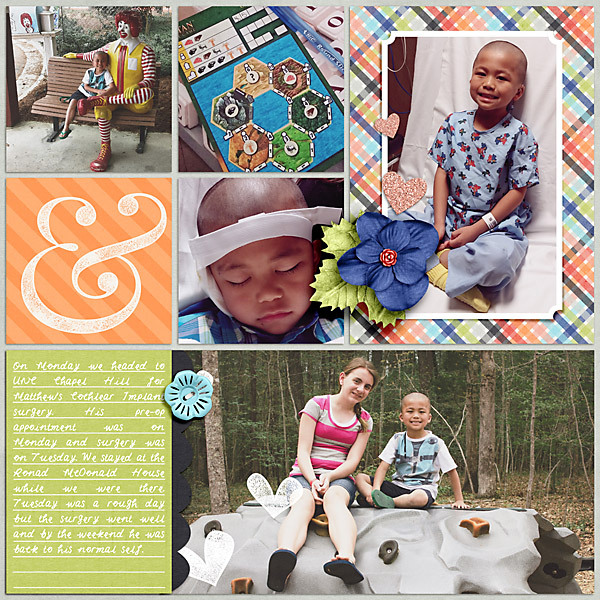 Matthew had his Cochlear implant surgery on April 14th (a very long awaited day). The surgery went great, but that first day was rough. The anaesthesia did a number on him. But it only took him a few days to get back to normal. I don't even think he'll have a scar. May 11th is the big day where we'll get the external processor and they'll turn it on. Here's a little more info on his hearing if you are interested, if not just skip all this babbling and take a peek at my page below. He wasn't getting any benefit from hearing aids in his right ear (the ear they implanted). With a hearing aid in his left ear he's in the moderate to severe range, but he's still picking up and understanding some English, which is quite amazing for what he's getting in just one ear. We are really hoping and thinking that getting some sound into that right ear is going to do some amazing things for this little boy. I'm excited to see what the next few months will bring for him. And on a sweet little note (which deserves it's own page), when Matthew was in the midst of being sick he rolled over grabbed my hand and gave me the biggest smile ever. He really is the sweetest little boy ever. Oh and I thought I would show you this. 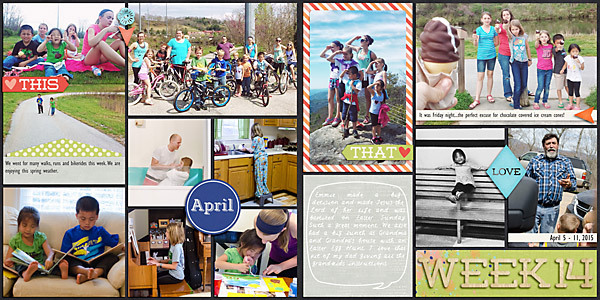 I finished theis April page for the 2016 Calendar I'm making for my mom (minus the missing picture from my sis). 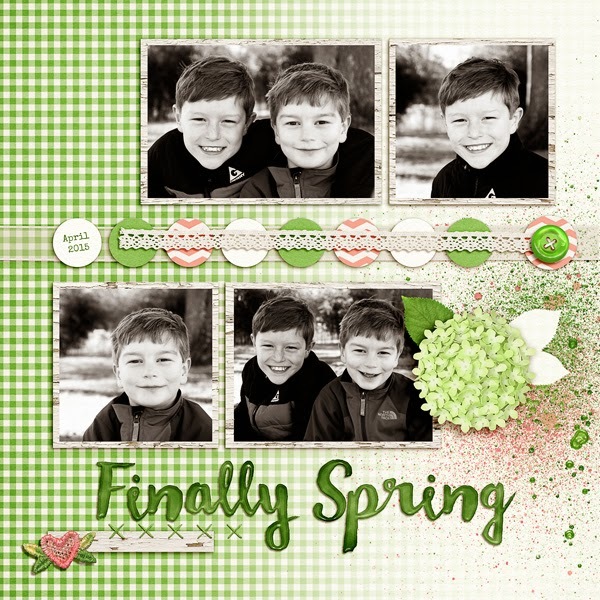 I'm loving this challenge over at Scrap Orchard. By the end of the year I'll have a calendar ready to print. Check out the challenge here. 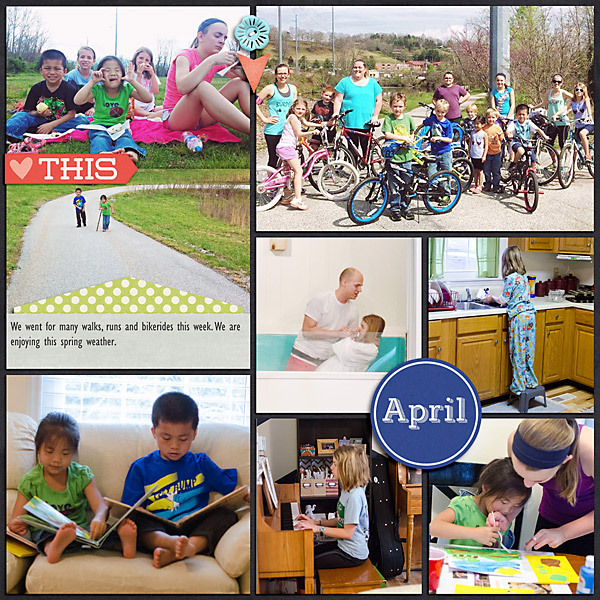 This week contained more bike rides, walks, and runs. It's been so nice here. We are enjoying getting outside as much as possible. I think it shows on my page. You may have noticed, but I've been getting even simpler with my pages. I think maybe it reflects just not having as much time to scrap as I normally would, but I'm totally dedicated to doing these weekly pages that if I have to do them simple then that's what I'm going to do. I've also been sticking to one kit a month. 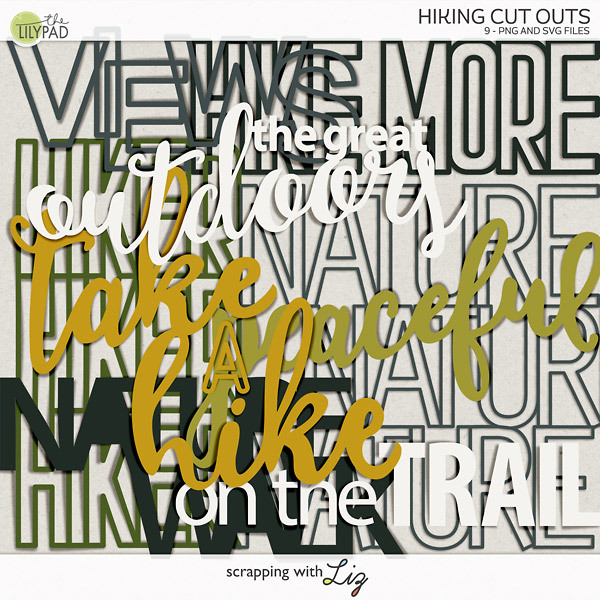 It also makes for easier and quicker scrapping. Right now I'm all about getting these pages done. One day I know I'll have more time to scrap but for now this is how I'm getting it done. Hello from New Jersey! This is Jenn, jk703, here today to bring you a fun tutorial, one that I consider a bit hidden! We are going to learn to use the Puppet Warp. 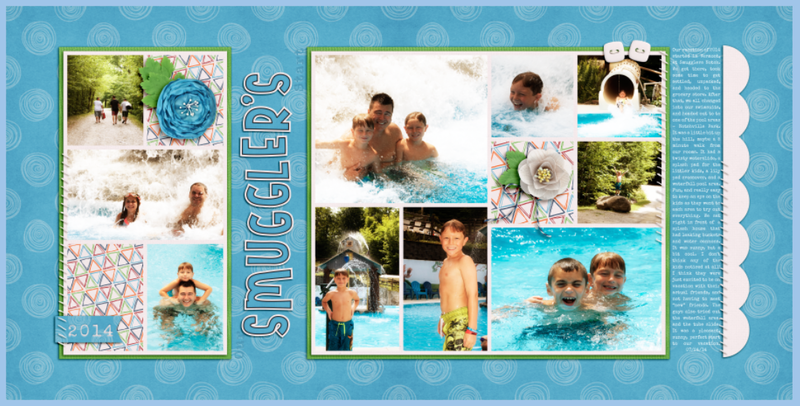 There are so many tools, and features to Photoshop, but I found this one was surprisingly easy. Puppet warp allows you to transform a layer and manipulate and distort images. 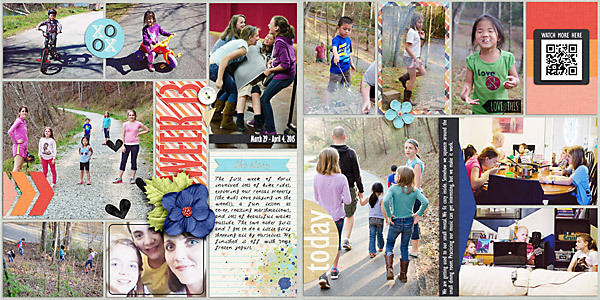 With that in mind, you might be wondering how it will be useful in scrapbooking. 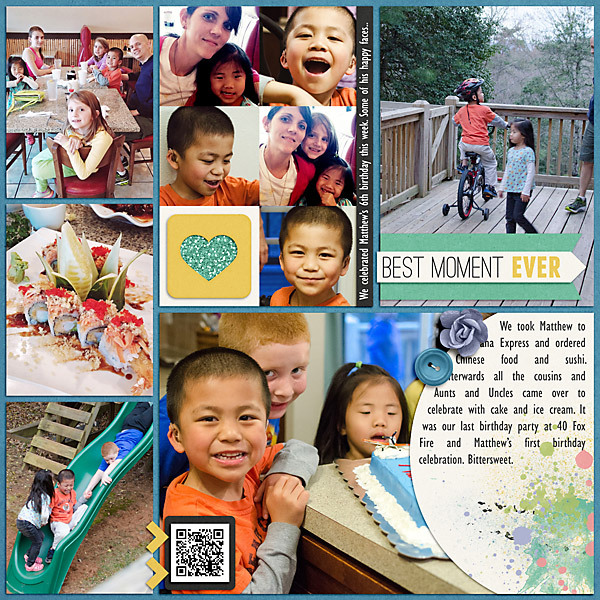 This feature can be used on text, photos, flowers and best of all, strings or ribbons. Even stitching. This is something you will use again and again. 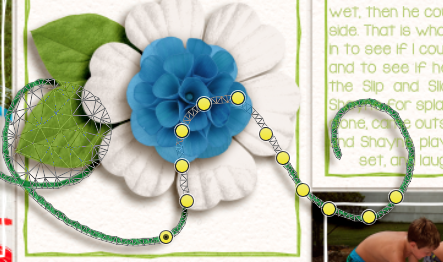 I originally was shown and then learned of this little feature when completing a challenge for the Month of Challenges at The Lilypad. I couldn't believe how easy it was, and how I never heard about it! Talk about underutilized! 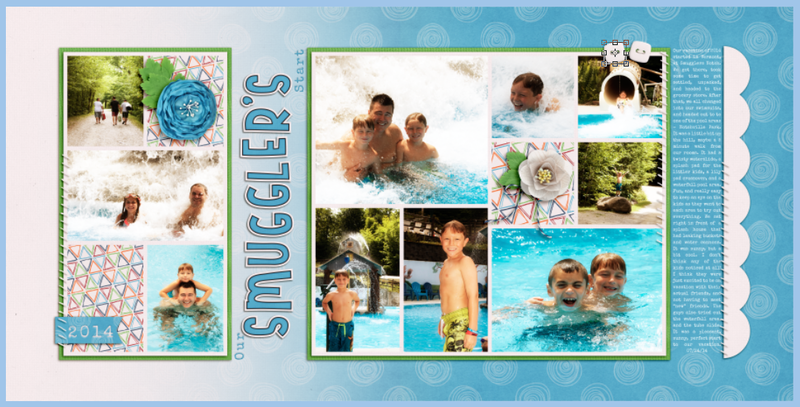 Here is the layout that I am working on. 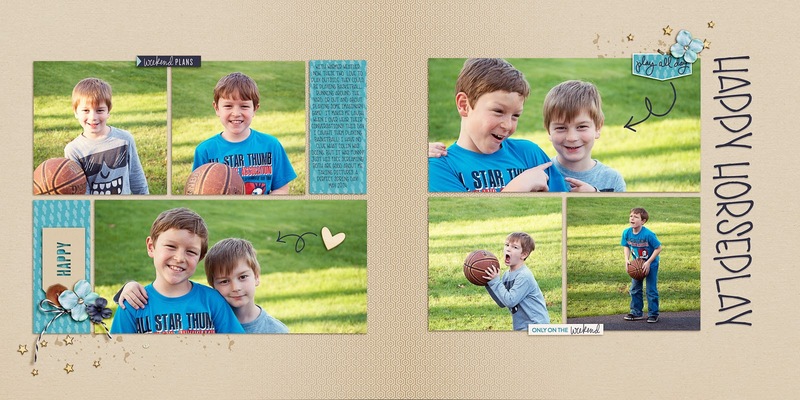 I've used Liz's Just Photo Templates. 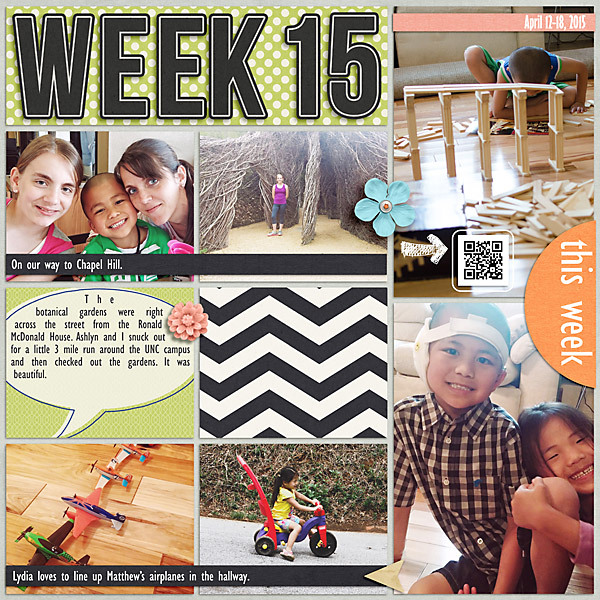 I've used a mixture of items from Chelle's Creations - Master Builders, Master Builder Friendly, and Doctor's Orders. My fonts are Wanderlust and KG Something to Believe In. See that string, I'm going to show you how to move it off of my journaling, and at the same time, make it look natural and not distorted. 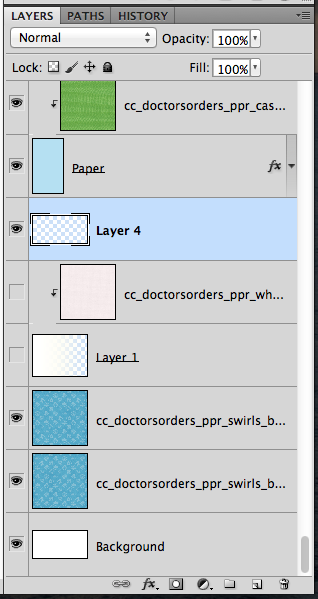 Choose your string layer in the Layers Palette. Next, choose Edit > Puppet Warp. 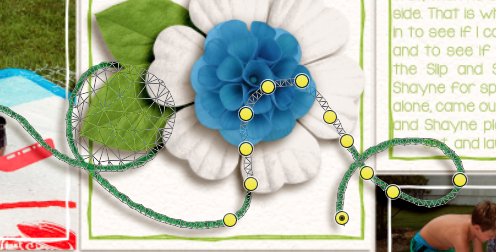 Now, click on all the parts of the string that you want to stay in place. You are leaving anchors, aka the little yellow circles. I usually stick to the areas nearest to the part that I am moving. I play on grabbing the end of the string, so I will leave a little leeway for the movement and change that will occur. One tiny note - see the last yellow anchor. It has a black dot inside. This is the "Active" anchor. That just means that is the one that will move if you click and drag using that anchor. I've decided I have enough anchor points, and have clicked on the end of the string too add and anchor. Without letting go, drag the end where you would like it to go. I felt it might naturally curl in more, so I brought it lower than the other part of the string. Then, I continued... as the string was working with me. Sometimes, it creates drinks and funny bumps. I kept curling and this is what I came up with. I noticed a bit of a drink forming where I left off - where the black dotted anchor is. The great thing is, you can do as many Puppet Warps as you can. So, I followed the same steps again, and decided to try to remove the crink. Here is my string, and I nudge it a little. Then I click the check mark again. Here is a close up of my un-crinked string. What do you think? Not too bad, right!? So, I used the Puppet Warp to straighten it out! Perfecto! Just a little thing can make me happy, and I did it so fast too! Thanks for visiting and I hope you love this little hidden gem too! Have fun! 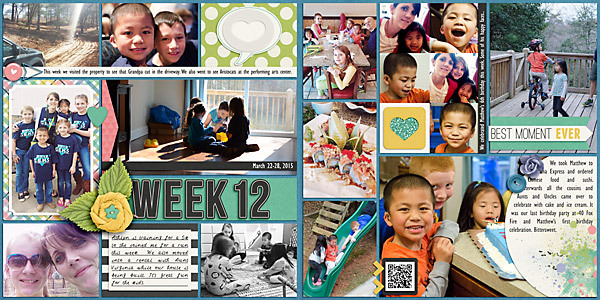 Week 12 of 2015. This will be a week I remember for a long time. We celebrated Matthew's 6th birthday, the first birthday he's ever celebrated. We moved out of a house we lived in for 7 years. A house that we brought two new children into. A house where my oldest daughter went from being a little 6 year old girl to an almost 13 year old young lady. A house with many memories. We are settled into our tiny rental while our house is being built. 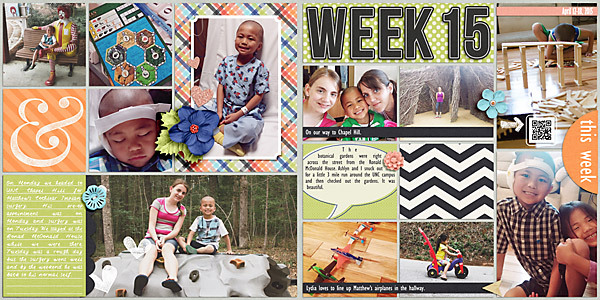 I'm sure we'll make lots of wonderful new memories....and thankfully I have these weekly pages to document them all. Hi Everyone! 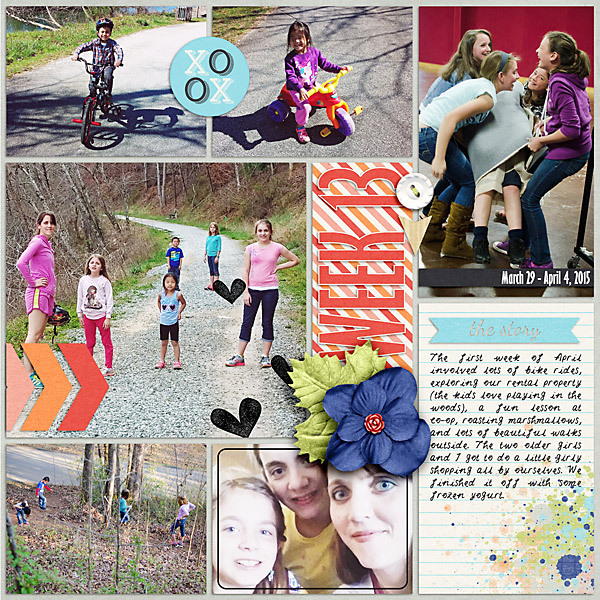 Jenn, aka jk703, here to show a fun way to work with patterns and background papers! I've been a gradient machine recently and have gotten a bunch gf questions on how I achieve that look. So, I'm here to share! 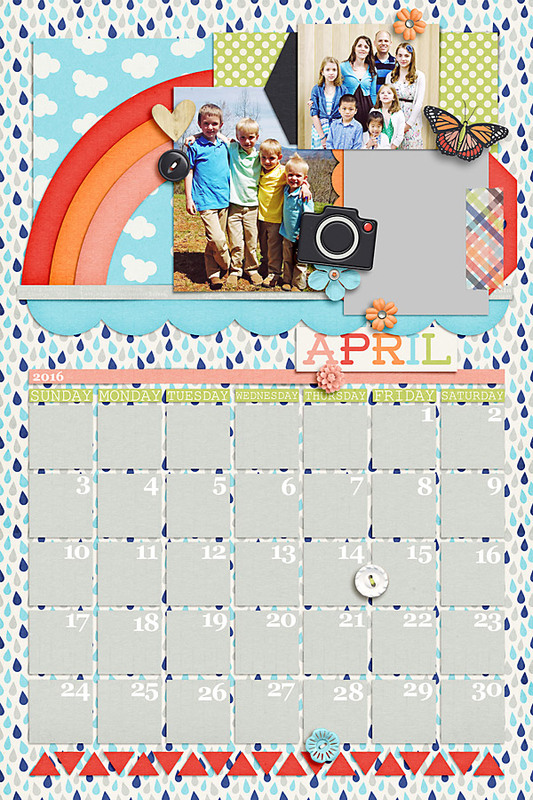 For the tutorial Examples, I've used Chelle's Creations Doctor's Orders Kit, and Liz's March Monthly Review Templates. Here is what my layout looks like below. See the white layer that blends into the blue? That is what I will share how to do! 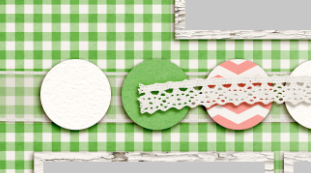 Here are my layers - and for this example, I've turned off my original gradient layer (Layer 1) and the white paper that was clipped to it. I've also created a new layer above the blue layers. Here is what the layout looks like if when the gradient layer is off. See... I felt like I needed to have more oomph for my background. I've chosen to use the Gradient Tool... It look like a little box that fades toward the right side. For the Gradient Layer - I have chosen the one closest to the bottom. There are LOADS of them in there, you can click on the super small arrow on the top box, and you can load more. I've left the Opacity at 100% and the other selections in the default state. 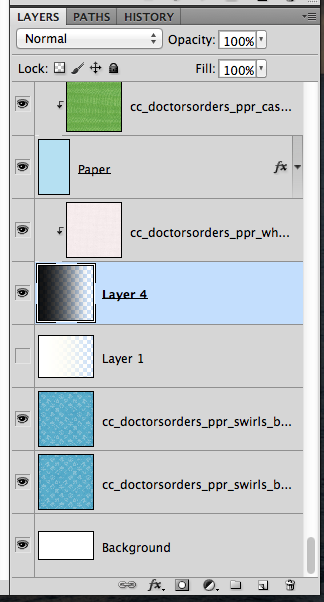 Here is what my Layers Palette looks like - the one Gradient Layer is Layer 4. 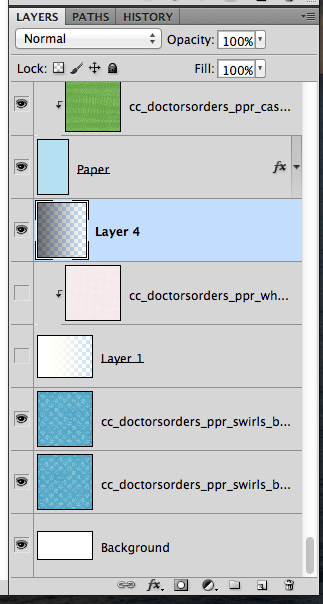 Next, I've brought in a white paper, and clipped it to the Gradient Layer. Seems too light, but definitely the effect I'm looking for. How do you make it darker? Easy! Just choose your Gradient Layer again from the Layers Palette, make sure you have the same Gradient Tool settings, and click and drag the cursor again. Keep repeating until you have the darkness that you would like. 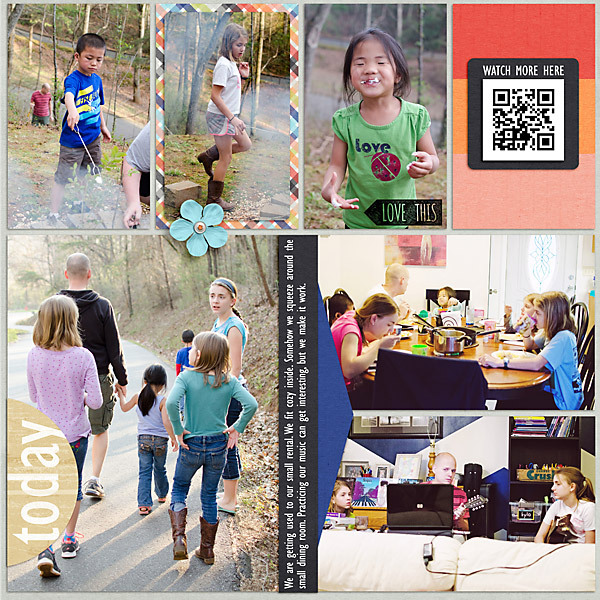 Here are a few more clicks on my Gradient Layer. Here is what my Gradient Layer looks like now. A bit darker on the one side. Just clip your paper and you're done! That's it! Super easy, right! 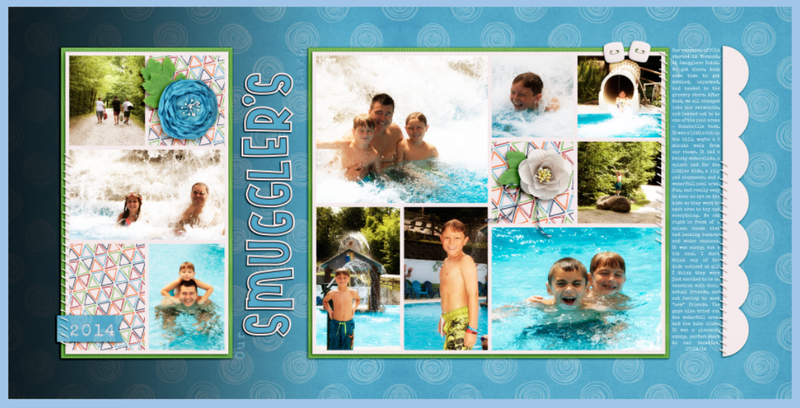 One more layout I did was with a gradient in the middle of a double layout. 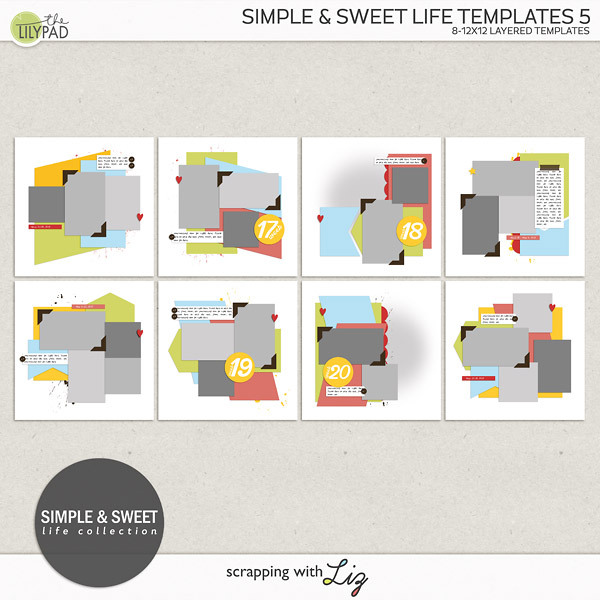 This uses Liz's Instalife Inspired Templates and lots of BYOC (Build Your Own Collab) from The Lilypad. Image is linked for credits. If you click, you will be brought to a bigger version, and can see the gradient blend better! This is a super easy way to change up the background! I'd love to see what you create! 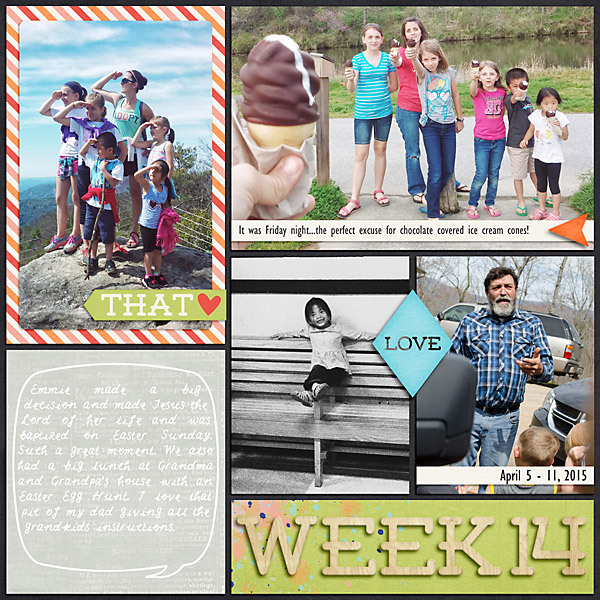 Thanks for stopping by and visiting Liz's blog today! I'll see you soon!